How Can We Use Our Individuality? Question: How can one use one’s individuality for the sake of a group and advancement? Answer: When you begin working with a group you see how your qualities are clearly directed against the friends. There is nothing in you that can be correlated with them somehow. You are completely different, distant from each other. You confront each other and hate each other. It is exactly here that you have an opportunity to connect with each other. So be it. Question: How can a person verify that his perception of the group, friends, teacher, and Kabbalah are true if he does this from his uncorrected state? Answer: It doesn’t matter. You work in relation to the group, so check yourself only regarding your friends. Do not worry, this is an established methodology. It comes from the very purpose of creation, from the connection between us. It cannot fail. In general, nothing in the world works, except for it. Question: What does egoism feel when working in the ten? Answer: Each one in the ten pushes back his egoism and aims toward the quality of bestowal and love for the other nine friends. This is called “the first nine Sefirot.” The tenth Sefira (egoism) goes down. It turns out that we build a network between us that should be equal, through its qualities, to the Creator. What does “equal to Him” mean? To the extent that I exit myself and rise in the ten by one or two units in connection with the friends, that is my spiritual level. To this degree I attain the Creator and reveal the lights of Nefesh, Ruach, Neshama, Haya, and Yechida. Question: At the same time, do I constantly push myself away from egoism without losing it in my sensation? Answer: Yes. Depending on the level of egoism (1, 2, 3, 4, or 5), I attain the Creator, His force in the soul. The Creator is the light and the entire system in itself is a soul. The more egoism, the more I rise above it; precisely contrary to the ego, I use it to connect with the friends, and to that extent I reveal the Creator. This is how the system is arranged. We must work together. The whole problem is in implementation because all of this is within us. How Is The Desire To Receive Different From Egoism? How Can You Solve A Problem In The Ten? Question: How do we solve a problem if it was revealed that there is no unity in the ten and we cannot come to a common opinion? Answer: There is no need to solve anything. You must continue working with each other and turning to the Creator. Let Him solve your problems. What can you solve by yourself? Which one of you is so clever? I don’t see anyone. Only the Creator can solve all problems. He gives them, but it seems to you that their source is one of your friends. That’s not the case at all. The Creator is the source of all problems. It is written about this, “I am the first and I am the last.” Turn to Him. Question: Should each friend appeal to Him individually or should we all do it together? Suppose that some problem arises in the group. Do not discuss it too much, but simply together turn to the Creator so that He will solve it. And it’s even better if it does not matter to you whether He solves the problem or not. The important thing for you is that you can turn to Him above this problem. If you treat this problem as a reason to turn to Him and through it to cling to Him tenaciously, you will see that the problem disappears. It arose only for this. Baal HaSulam, “Letter 11”: I will also ask that you make great efforts in love of friends, to devise tactics that can increase the love among the friends and revoke the lust for bodily matters from among you, as this is what casts hate, and between those who give contentment to their Maker there shall be no hatred. Rather, there are much compassion and love between them. We are participating in the correction of a broken vessel, a desire that once split into many broken parts. Now we have to connect them together, and as we join them, we begin to increasingly feel the Creator. Each of us represents a single egoistic desire. Connection with anyone requires us to be altruistic, giving, yielding, possessing a quality of bestowal at least in some way. Such connection is called “love” because to do so I must feel the desires of another and fulfill them, and that person should also relate to my needs and mutually fill them. Our desires are clearly directed toward the Creator. Therefore, I understand my friends’ aspirations, as does each of us. The more we unite, the more the Creator will be revealed between us. Therefore, we have to constantly think about how to rise above ourselves so that the connection between us will be more important than a person’s connection with himself. This is possible. We just need to think about the mutual connection, to read more. This is how the surrounding light’s influence grows on us, and I begin to understand that this has become very important to me. Sometimes our efforts take months, even years. The higher a person’s soul (that is, his desire), the lower it fell after the breakage and became very coarse and heavy. A person with a bigger soul has a harder time connecting with others because in the broken state he is further away from correction. The heavier the soul, the worse it is in its uncorrected state, thus the better and higher than others it becomes when corrected. Therefore, one can never despair. On the contrary, more effort should be applied. 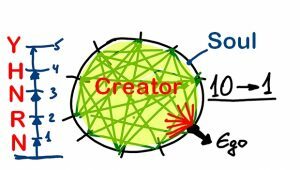 In general, the work in the ten, thinking of how to reach connection and reveal the Creator in it, all these thoughts and efforts attract the light and the light corrects us. We have to apply as much effort as possible toward attempts to connect, toward thoughts on this topic, and then we will succeed. Especially now, when many of us are beginning to feel the need to connect and others feel the necessity of increasing the importance of the Creator in obtaining the desire to bestow, we approach a state where these actions become actual and real to us. The extent to which a person is engaged in the group, even if, due to the heaviness of his soul, he is not easily influenced, he will still advance under the group’s influence. Therefore, we have to try to achieve full connection between us and the Creator. If I want to connect with a friend, I find I need the help of the Creator. The more I ask the Creator for help, the more I feel my dependence on Him. To the extent the Creator strengthens my connection with the friends, I establish a connection with the Creator, I begin to understand and feel Him. All this is revealed within my connection with my friends, within human relations, not in some abstract feeling of the Creator. I feel the Creator, I appeal to Him because I need Him as a mediator standing between me and my friend. A I reveal different types of connection with a friend, I attribute it all to the Creator. Between me and my friend there is a difference of potentials, which the upper Light, the Creator, fills, like a current flowing between two poles. The 613th commandment is love for the Creator. We can fulfill 612 commandments, but not the 613th. The last commandment comes from above. The 612 commandments are the correction of the connection between the parts of the broken soul. 612 Lights glue and fix the shattered fragments of the vessel. The 613th commandment is an addition to the full, complete Kli—the Light of Yechida—coming from the Creator himself. We ourselves are not capable of any action regarding this commandment. In Adam HaRishon before the shattering, there was no mutual inclusion of desires into each other. But after the shattering of the common soul, all its parts were mixed and penetrated into each other in an infinite number of variations, which allows a person to deeply understand and feel the Creator. Prior to this, the sensation of the Creator by Adam was “circumcised,” as if in a small child. He did not have the tools to penetrate deep into the Creator. And due to the shattering and interpenetration of all parts that require working on their correction and asking for the help from the Creator, a man becomes acquainted with the inner world of the Creator and penetrates deep inside Him. Before the shattering, Adam received the Light only into the body of the Partzuf at the level of Nefesh – Ruach. But thanks to the shattering, we can raise the reflected Light from the screen to the head (Peh de Rosh) upward, as if we are entering inside the Creator. And then the Light spreads from top to bottom to this height of the reflected Light, to the height of attaining the Creator, and we attain Him in ourselves. This determines the measure of our mutual inclusion, merging with the Creator: to the extent we attain the Creator in the head, to this extent we unite with Him through the body of the spiritual Partzuf. The solution is only in connecting in the tens. Meanwhile, we cannot overcome the separation between us, our mutual rejection. We want to receive all the answers from our connection in the ten. Whatever happens in the world, I look into the ten and from there I get every answer. I arrange myself in this way and then I suddenly feel that there really is a system that can respond to any of my questions. Question: What should we feel first: the desire (lack) of the Creator or the desire of a friend? Answer: It can be both. We must come to adhesion with the Creator, that is, to complete connection with the quality of bestowal. This can be achieved only through the group. Therefore, you must first fully connect with the ten. This can only be done if you demand that the Creator gives you the quality of connection, the quality of mercy (Hassadim), so that He will influence you with surrounding Light (Ohr Makif) with the help of which you can unite with your friends. You use the Creator to unite with your friends and you do it in order to adhere to the Creator. This is a constant triangle. Therefore, you must act in both ways. That is, use the ten in order to achieve adhesion with the Creator, to give Him pleasure, to work for Him; and on the other hand, unite within the ten. In order to do this, you need to turn to the Creator so that you have the power to unite with the ten. You must constantly spin in this triangle. The most important thing is to come “from the love of friends to the love of the Creator.” Therefore, use the Creator to achieve love of friends, and from them, from the highest point that can be achieved, the union called love, when you are included into one desire and one intention, you will be directed toward the Creator together as one whole.